In a game that was closer than they would have liked, the Oklahoma Sooners avenged last year’s loss to Iowa State, 37-27 in Ames, IA. 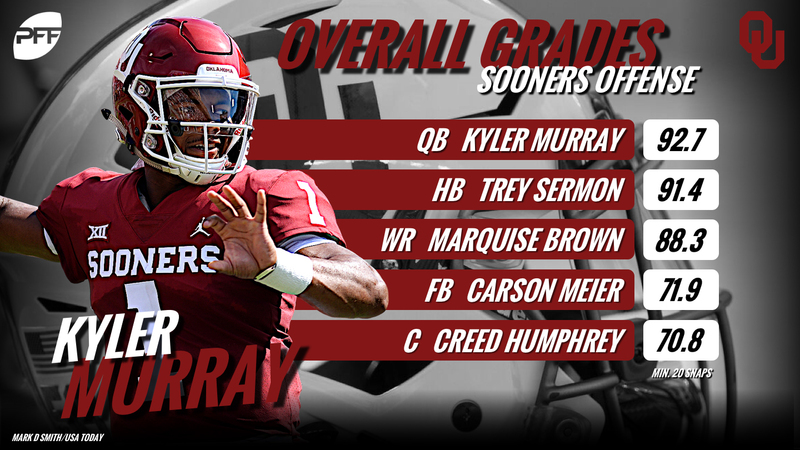 The story starts with Oklahoma quarterback Kyler Murray who solidified his standing in the Heisman Trophy conversation with a season-high 92.7 overall grade, going 21-for-29 for 348 yards and three scores through the air, while adding another 84 yards on 11 carries. This recap is brought to you by Eckrich, the Official Smoked Sausage of the College Football Playoff. Murray hitting a deep post route for a touchdown has become a familiar sight, and it was WR Marquise Brown on the receiving end of the 75-yard score in the first quarter. For the game, Murray finished with four big-time throws while avoiding any turnover-worthy plays. As for Brown, his 88.3 overall grade raised his season mark to 89.9 as he hauled in nine of his 12 targets for 191 yards and the touchdown. Seven of his receptions went for first downs. 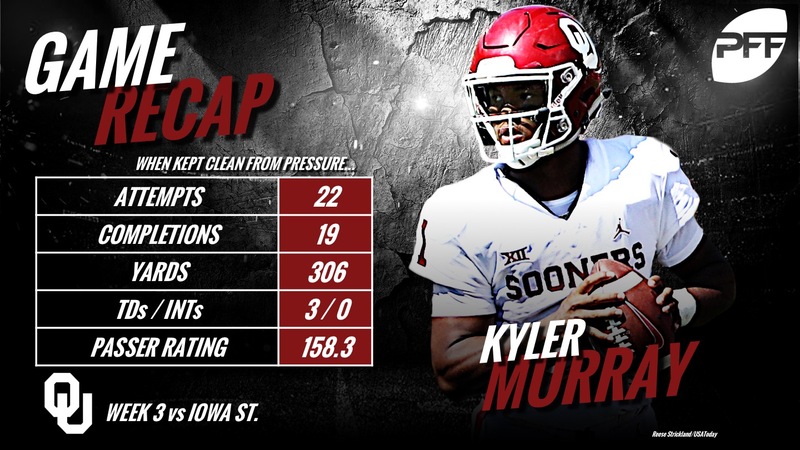 Up front, the Oklahoma offensive line was outstanding, only being charged with two pressures on 34 dropbacks with a few other pressures coming late in the down or in clean-up situations. It all led to Murray going 19-for-22 for 306 yards and a perfect NFL passer rating of 158.3 when throwing from a clean pocket. On defense, outside linebacker Mark Jackson, Jr. earned the highest grade at 80.8 as he notched a team-high five pressures (four hurries and one sack). Defensive tackle Neville Gallimore led the Sooners with an 80.5 grade against the run, while LB Curtis Bolton led the team with six stops. Offensively for Iowa State, WR Hakeem Butler was the clear star, as the 6-foot-6, 225-pounder had one of the best plays of the weekend as he caught a pass up the seam and broke multiple tackles on his way to a 57-yard score. He finished with 174 yards on only five catches, good for an 88.6 overall grade that paced the Cyclones. At quarterback, Zeb Noland performed admirably as he filled in for starter, Kyle Kempt, and he graded at 77.3 from a clean pocket, but only 39.8 on his 15 pressured dropbacks. DT Ray Lima picked up the highest grade on Iowa State’s defense at 74.8, while star CB Brian Peavy was targeted only once for a 26-yard gain. Ultimately, it was the lack of pass-rush that did Iowa State in as DT Jamahl Johnson led the way with three pressures, and the Oklahoma passing attack was too powerful to stop when Murray had time to throw.